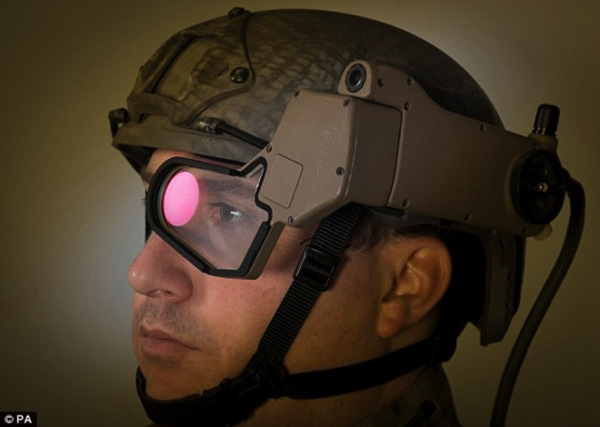 U.S. Army’s AR headset to give soldiers Iron Man vision #WearableWednesday « Adafruit Industries – Makers, hackers, artists, designers and engineers! DVICE has the story on this new development being tested by the U.S. Army. Once upon a time, when you got your hands on a new gadget, you could be sure the military had a bigger, better version. It would seem that’s no longer the case since BAE Systems has just announced the first Augmented Reality (AR) headset for troops in the field. With Google Glass and a veritable cornucopia of other AR headsets either in development or already available, you might have thought that the armed forces would have had its version of the tech years ago. The headset is called Q-Warrior, and it is currently being field tested before troops get to don them. As you might expect, it focuses more on function and durability than your average headset. Q-Warrior is a single see-through display, which can be mounted securely onto existing military helmets, giving soldiers real-time data when they need it. On a basic level, Q-Warrior overlays data such as personnel tracking, hostile enemy detection and waypoint information over a soldier’s field of vision like a video stream. It also includes enhanced night-vision and full-color feeds to and from other allied forces in the area, including aerial images from spy drones overhead. BAE Systems states that the Q-Warrior is both lightweight and low-cost, giving soldiers a reliable edge on the opposition in terms of organization and information. With the U.S. Army also developing a real-world Iron Man super suit, it looks like our soldiers will soon have the vast majority of Tony Stark’s toys. Wrist-mounted mini-missiles and flight might have to wait for the army’s next generation of tech, but it looks like Jarvis and bullet-bouncing brawn will both be in the army’s Mark I Iron Man tech.